On October 20th in honor of our Lady, Mater Admirabilis, students wear pink and attend an all-school liturgy. Philippine Duchesne was the first Religious of the Sacred Heart to bring the Society to the Americas. She was canonized by the Church on July 3, 1988. Her feast is celebrated on November 18th. The Third Grade presents Philippine’s life in an outdoor play and students attend school liturgies. Madeleine Sophie Barat founded the Society of the Sacred Heart in 1800. 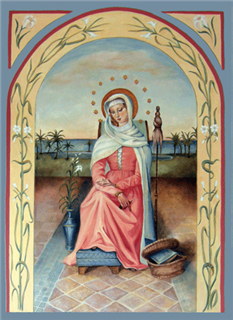 Across the world her feast day is celebrated on May 25. At Carrollton, the Fifth Grade tells Sophie’s story through a play. The all school liturgy includes a special blessing for the Seniors. Celebrated in June, this important feast is the day the Religious of the Sacred Heart worldwide renew their vows. This practice of five minutes of silence helps everyone develop an openness to the mystery of God. Everyone at Carrollton spends a few moments in quiet reflection and prayer daily. Congé is a surprise holiday organized by the graduating class for the entire school. It is a well loved Sacred Heart tradition in which the whole community participates in a day of fun. This word brings a smile to one and all. It literally means a “snack” in French. Goûter is a treat that is usually coupled with Feast Days.